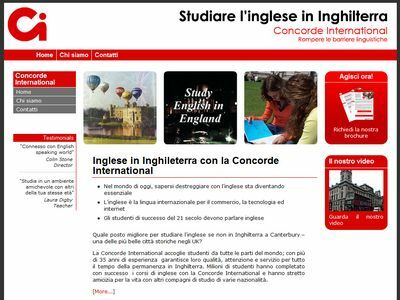 Cornish services have designed websites in Italian such as the website below for a language school in Canternury, Kent. The Italian language uses the Latin character set. Like English, Italian is written from left to right. Italian websites require more room for text than English websites, so this can impact on menus and general layout. Italian words also tend to be longer which again can impact the visual appearance of the website. The Italian language code is DE..
A Italian domain name (.de) is beneficial in terms of making the website look more Italian to Italian speakers and it also helps get higher rankings in the search engines. Google is the most popular search engine in Italy but it does not have the same dominance as in other countries such as the UK or Germany. Market share is baout 60%. The next two most popular search engines are Italian MSN and Virgilio, and Italian search engine. Cornish can provide different levels of search marketing in Italian. For all websites we design we automatically submit these to Yahoo and Google. We are also able to offer varying levels of ongoing search engine marketing and paid search (PPC) advertising. For paid advertising the most important in Italiany is Google then Yahoo. We have experience of search marketing in the Italian search markets. Looking for a company to translate and host your website in Italy? Cornish WebServices can provide a full translation, design, hosting and search marketing service in Italian and many other languages. We always use natural language speakers for the translation work to give the best results.